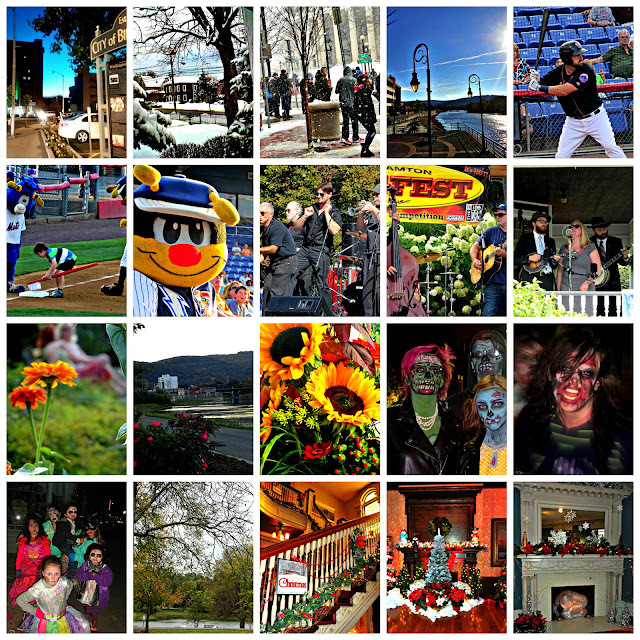 Shining the spotlight on Binghamton, NY - the community and its people. As Patti Loves Bing quickly approaches its four year anniversary, it seems appropriate for a moment of reflection. Since May 5, 2013, I have written about the many organizations and businesses in this area who have worked to make Binghamton shine. Honestly, though, it's the people of Binghamton who are the beacons of light and hope for our community. We have all heard that old saying, "A picture is worth a thousand words." Well, how about 10,345 pictures from 110 distinct events in 12 months? That is how many have been shared on our Facebook page in 2016 alone. Over 10,000 photos of the "Faces of Binghamton", with an occasional dog, giraffe and parrot thrown in. I get it; just as many of you do. Binghamton is not perfect. However, for every negative there are always several positives to be found. We just need to look into the eyes of these "faces" to see the excitement and wonder that exists among us. As with any city going through change, there are many things about Binghamton that will be in a state of constant flux. Businesses will open and close; crime rates will fluctuate; and buildings will be torn down while others are built in their place. The one constant, in my opinion, will always be the people that call this area home. As we enter our fifth year, I have just one request. Take a moment that next time you are feeling down about our hometown and check out the "faces". Whether they be old, young or in-between; they are truly the beacons of our community and definitely need to be celebrated. I know that I will continue to celebrate them and Binghamton as long as they will allow me. Tomorrow is Christmas Eve and the first night of Hanukkah. These are just days on a calendar. It is the spirit behind them that we should be embracing and celebrating. We all have our own interpretation of what that spirit is or should be. Christmas has always been one of my favorite holidays. Having been raised Roman Catholic, I am well versed in the religious aspects of the holiday; however, Christmas for me encompasses much more than religious imagery. It is the spirit of Christmas that I embrace. Not necessarily the spirit of giving of presents; but the giving of kindness and good cheer. There are the images of the season; in particular, Santa Claus, that remind us of this spirit. 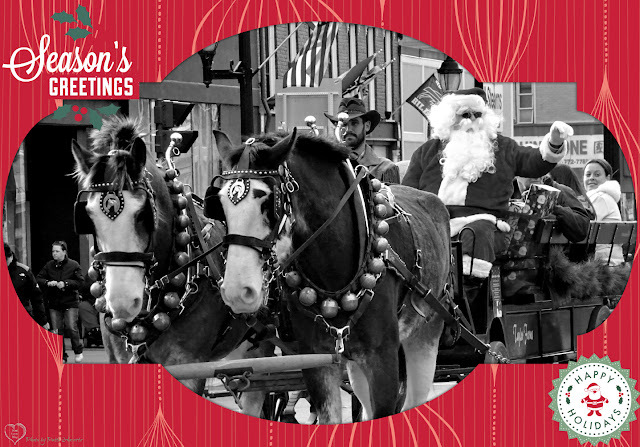 Santa embodies the spirit of kindness and goodwill. He sees beyond a person's economic, religious, political and social background. He does not care what your nationality or race is. All he is concerned with is whether you have been naughty or nice. Okay, so let's be frank here. Everyone has at one point in their life found themselves on the naughty list. Anyone who claims to have never made one mistake in their life should automatically be put on the naughty list just for that lie alone. I honestly believe that Santa takes into consideration the effort we make to learn from our mistakes. Santa Claus is a forgiving soul and always seems to find the goodness in everyone. Although the spirit of Santa Claus is usually associated with children; as adults, we should never lose sight of what his spirit embodies. Santa, for me, ranks right up there with snowflakes, twinkling lights, reindeer and sleighs as things that remind me of what makes this season so magical. Visiting with family and friends, recapping the year's events over hot cocoa and cookies, can be more rewarding than opening any present found under the tree. Being greeted at the door by a group of Christmas carolers is more satisfying than fighting a mob of people at a store in the mall. Taking a ride through the neighborhood admiring the lights on the houses reflecting off the new fallen snow can be in itself a "religious" experience. So, let's take a moment to embrace and celebrate the spirit of the season. Let's put religion and political correctness aside and appreciate the various holiday greetings for the spirit in which they are extended. Just as I am not offended by having someone say Happy Hanukkah to me because I have a common Jewish last name; I find it hard to believe that anyone would be offended having the words "Merry Christmas" being directed to them. They are given in the spirit of kindness and goodwill. In the spirit of the season, I wish each and every one of you a Happy Holidays, Happy Hanukkah, Joyous Kwanzaa, Happy Festivus and, of course, Merry Christmas! I have a confession to make. I allowed myself to be caught up in a little something people like to call having a swelled head. I found myself both honored and humbled by the positive feedback I was receiving from the photos being posted on Facebook. Rather than taking the compliments for what they were worth, I decided to try my hand at selling prints at both Binghamton Pride Palooza and this past weekend's July Fest. In doing so, I became so wrapped up in myself that I lost sight of why I began this blog and the Patti Loves Bing Facebook page in the first place. It took two things to bring me back to my senses. First, it was the number of people who stopped by my tent and spoke to me about how much they enjoyed the Patti Loves Bing page. 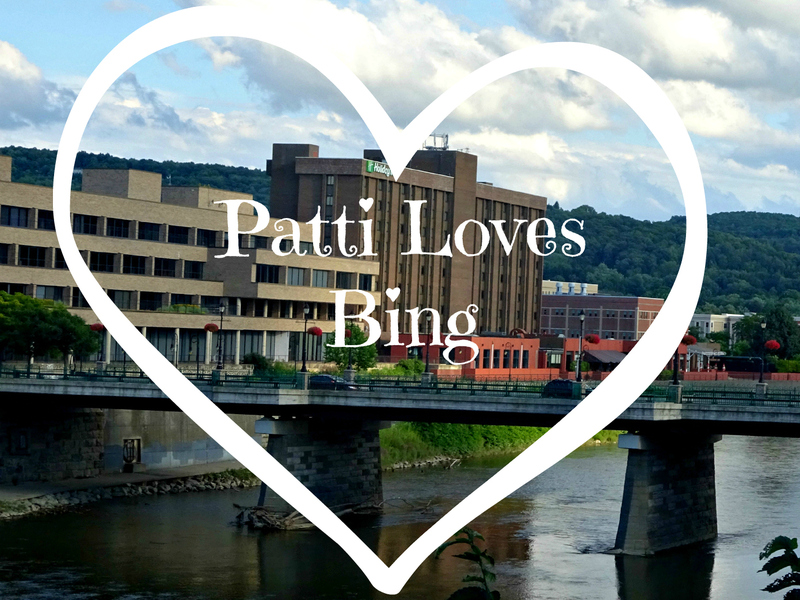 Showcasing the area in a positive light has been and will always be the focus of Patti Loves Bing. Having people thank me for doing just that was worth more than any number of photos I may or may not have sold. Second, it was finally sitting down to review the photos taken on Saturday of the Parlor City 5K Run. I had not realized until that moment that I had been feeling anxious about getting them posted for all to see; especially the participants in the race. Thinking back, I was probably the most relaxed taking the photos than I had been all weekend. Putting the focus on the event and the participants came naturally. I was in my element. I owe you all a huge apology for straying from what made Patti Loves Bing what it is today. Binghamton and the surrounding area, along with its people, businesses and community events, will once again be my primary focus. Shining the spotlight on all things positive. This is what I was meant to do. This is where I was meant to be. In a recent message from a friend; one that I have known for close to a decade, he stated, "Tell them you're from the media." Well, let's be honest here. I am not in any way the media. Not in the true sense of the word. I am simply someone who shares the positive aspects of the greater Binghamton area across various social media platforms. 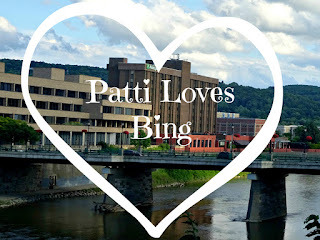 Even then, I cannot begin to compare Patti Loves Bing to the likes of What's Goin' On Binghamton or Bingpop with regard to the number of followers and coverage. However, my friend's six words did get me thinking. Our traditional media outlets have their hands full reporting on the more serious side of life here in the Southern Tier such as crime, the heroin epidemic and, of course, the ever popular politics, both local and national. Their resources in terms of staffing has been stretched to the limits. They cannot possibly report on each and every event, concert, play or fundraiser happening in and around Binghamton. Why shouldn't we be the reporters of good? In a way, we all have the ability to share the positive aspects of our community; especially via Facebook. It's up to us to be that collective voice heard over all the negative and hateful posts about our hometown and its residents. My challenge to all of you is to share the positive about our area. Whether it's a Facebook event, photos from the event, or simply a message of a job well done toward a member of the community. The more we collectively share the positive, the less the naysayers will have to stifle our voices. While I cannot be at each and every event nor share every bit of good news, please feel free in sending me photos or links to be shared on my page. As for upcoming events, What's Goin' On Binghamton and BingPop have the mechanisms set up to get your events posted on their websites. It's up to all of us to spread the good news. On this unseasonably warm Christmas Eve, let us all keep in mind that it is not now much money you spend or how many presents you receive. The true spirit of the season is found among our family, friends and neighbors. Over the last twelve months, I have seen this spirit permeate throughout our community at each and every event I have had the pleasure and honor of attending. Our community has come together in both good times and bad. Thankfully, 2015 had more good than bad. However, no matter the circumstances Binghamtonians have proudly stood by and with each other. I wish each and everyone of you a very Merry Christmas, Happy Hanukkah, Happy Kwanzaa, Happy Festivus and a Very Happy New Year. As we enter Thanksgiving week, our thoughts turn to time with family and friends over turkey, stuffing and pie. We also think back over the past year and offer thanks for the good we have experienced and seen over the last twelve months. It is difficult, at times, to see past the negative surrounding us on a daily basis. We have all experienced setbacks, loss and hardships in our personal and professional lives. The Binghamton community has proven that there is always something to be thankful for. 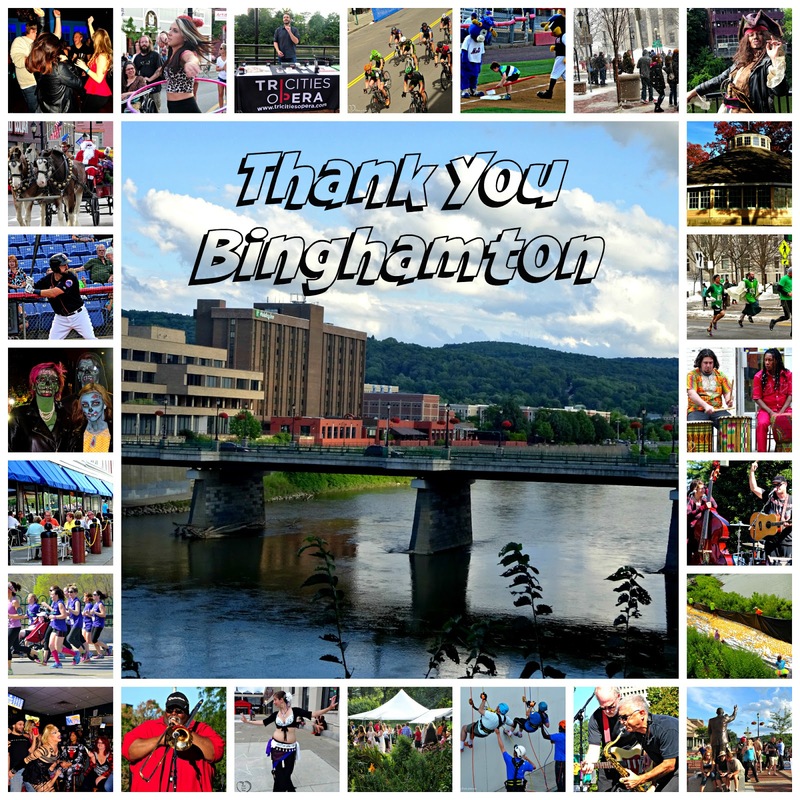 Binghamton, we offer our thanks. Thank you for opening our senses to newly discovered music, art and theater. Thank you for expanding our taste buds with the ever growing dining options. 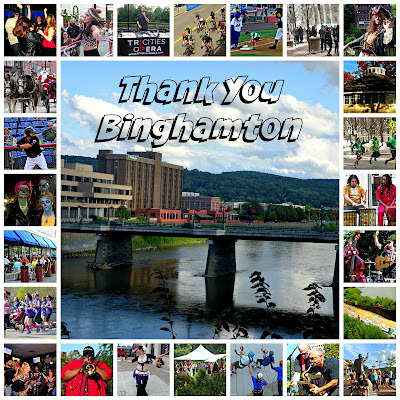 Thank you for playing host to the parades and festivals that draw hundreds, if not thousands, to the Binghamton area. Thank you for giving of your time and financial resources to those who need it the most at the many charitable events that happened throughout the year. Finally, thank you for allowing us to experience it all with you. For years you have endured the reputation of being an aging rust belt city in the heart of Upstate New York. You have survived two devastating floods within a five year span; a senseless mass shooting that garnered national attention; your unemployment rate and poverty level are both among the highest in the state; and your infrastructure, at times, may leave something to be desired. Despite all this, you have managed to rise like a phoenix from the ashes. There will always be those who refuse to say anything positive or encouraging about you. They find fault with you and those who work so hard to make this a better place to live, work and study. Sadly, when your supporters lash out defensively toward these detractors, nothing is accomplished. A wider divide is forged between your cheerleaders and those having difficulty acknowledging the progress that has and continues to be made. Truthfully, there will always be those that will verbally attack anyone who is trying to promote your progress, beauty and diversity. Retaliation against these attacks only serves to bring your supporters down to the haters' level and does not bode well for your image. Binghamton, you have much to offer the residents, students, businesses and professionals that call you home. Your strength and endurance to overcome the worst that nature, economics and basic human foibles have cast upon you is something to celebrate. You are the beacon of hope for a better future. One that your supporters who are, at times standing alone in their confidence of you, can look toward for continuing strength and inspiration.